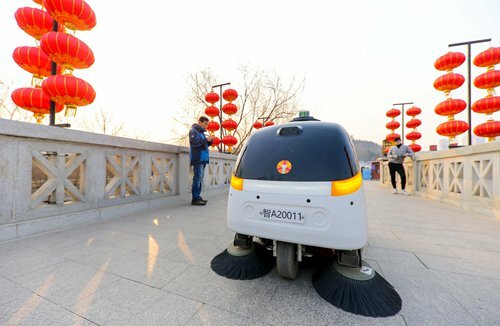 Chinese top artificial intelligence (AI) start-ups favored by venture capital investors in recent years are setting up their own development paths. Although the nation's AI industry is somehow overshadowed by the US' latest move to undercut China's growth in the sector, many companies and analysts still remain confident about the future. Six Chinese AI companies have entered the annual cohort of the most promising 100 AI start-ups on a list CB Insights published on February 6. Among the 11 unicorns, private companies valued at more than $1 billion, there were five Chinese companies - Sense Time, YITU Technology, 4Paradigm, Face++ and Momenta. China's top AI start-ups have become prized by investors due to China's vast market and AI technology application prospects, analysts noted. "It means investors are confident with the technologies developed by Chinese start-ups, as well as their business strategies and market potential," Zhang Zijun, manager of the AI industry research center at Beijing-based CCID Consulting, told the Global Times on Thursday. Sense Time and Face++ were the best-funded companies on the CB Insights 100 list, which said that they have found specific fields to focus on in the coming years. In a notable example that local AI companies assumed global prominence, YITU Healthcare announced on Tuesday that it has successfully used natural language processing (NLP) to achieve high accuracy rates that are on par with doctors in terms of reading electronic health records and making diagnoses. The results were published in Nature Medicine, marking the first time that a top medical journal has published research findings regarding the employment of NLP technology in making clinical diagnoses. Sense Time, a start-up that specializes in computer vision and deep learning technology, told the Global Times on Thursday that it will promote applications in fields including mobile phones, education, autonomous vehicles and healthcare. Face++, a facial recognition technology service provider, will focus on AI plus the Internet of Things. The announcement was made during a press conference in January. "China's AI industry is still in its infancy. It's promising, but their future growth is uncertain. Companies come with different backgrounds, and most of them are still in the trial-and-error mode," Zhang said. "Just the top companies tend to enjoy better resources." Chinese AI start-ups overtook their US counterparts in 2017 in venture capital funding, but the US' latest move to undercut China in the high-technology sector has clouded the outlook for China's AI industry. The US on Monday rolled out a plan to give AI more priority and supportive resources. China's AI is indeed lagging behind the US, but containment measures that are against the fair market rules will not have much impact on China's research and industry, analysts said. "Academic exchanges between countries are difficult to limit through the administrative blockade," Zhang said. "Only cooperation could benefit both sides. When the US puts restrictions on China, it limits itself too."